I read this beauty-oriented article claiming that canned fish is more sustainable than fresh fish. Is this true? Listed below is a brief energy/sustainability brain dump on the subject. There are probably factors I haven't taken into account. A study of canned mackerel and herring shows that the production of the aluminium can is responsible for most of the products carbon footprint (Buchspies et al. 2011). Impacts associated to transport are slightly smaller compared to frozen codfish. 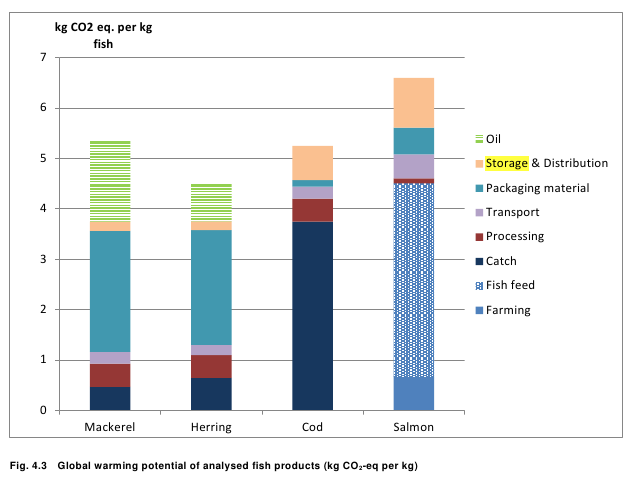 Storage of frozen fish obviously requires more energy than storage of canned products, however it doesn't seem to be enough to shift the balance (see figure below). Keep in mind that we are comparing different fish here. As you mentioned fresh fish may require additional energy in the form of ice and packaging material production. A while ago I conducted a life cycle assessment of fresh sardines that, occasionally, when the market was saturated were also canned. The canning didn't take place close to the landing site. So either way frozen or chilled transport was necessary. Furthermore, the fresh sardines were marketed within hours, essentially eliminating storage. Judging from that I cannot imagine that the benefits of canned products (energy free and unlimited storage, condensed transport) outweigh the vast processing effort, especially regarding the production of aluminium cans. Buchspies, B., Tölle, S.J., and Jungbluth, N. (2011). Life Cycle Assessment of High-Sea Fish and Salmon Aquaculture. ESU-Services Ltd. It depends on where you need to get your fish from. If you live in a town that has an active fishing industry, or you have local fish farms, I would say your local fresh fish is the best option. Eat it as soon as possible so you don't have to waste energy keeping it. If you have no local fish options, canned or otherwise preserved fish may be a more sustainable, if less healthy, alternative to having fish packed in ice/freezers flown in from wherever it's caught/harvested. Not the answer you're looking for? Browse other questions tagged energy ecological-footprint fish or ask your own question. How can I assure that fish stock for my aquarium are coming from sustainable sources?